A modern take on the changes of the standard You Stepped Out Of A Dream, with a rhythm section counter melody to the horn melody. A Rhythm Section Workshop version is available, showing how well it works in a trio setting. This song sounds both modern and hard-bop-ish. It's not immediately obvious that it is a line over the changes of the standard tune You Stepped Out Of A Dream due to many chord substitutions; however, there are some clues in the faster lines that outline the changes, such as in the seventh measure. The rhythm section figures keep up a constant dialogue with the horn melody; they are sometimes hits and sometimes melodic lines, and all fill in around the melody. This amount of rhythm section activity is one thing that this song shares with Chick's Tune, Chick Corea's early line on You Stepped Out Of A Dream changes. Don Sickler remembers being captivated when he first heard So You Say many years ago, realizing that Cecilia was both a composer and pianist he wanted to be involved with. Since she moved to New York, she's been very active on jazzleadsheets.com projects and can be heard on many of our exclusvie audio tracks. The solos are on the original changes, with one exception: the D♭maj7 instead of Cmaj7 on the last two measures, which on the recording is almost always hit on the "and" of beat 4.
rhythm section players: Although the three-page Concert Condensed Score gives you a complete picture of what's going on in the arrangement, now that there are also Rhythm Section Workshop individual parts, you might prefer using them. Click on the third album cover for more details. "Home" is Cecilia's third album as a leader. The second, "Young and Foolish" from 1993, featured the same personnel. Trumpeter Steve Huffsteter also played on Cecilia's next album, "The Impostor"; drummer Kendall Kay was on her first, "Words of Wisdom". In 2002, Steve, Cecilia, and Kendall all played on a big band album featuring Lee Konitz and arranged and conducted by Mark Masters, "One Day With Lee." Cecilia was also the pianist on Mark Master's "The Clifford Brown Project," joined in the rhythm section by Putter Smith (bass), Joe LaBarbera (drums), and a horn section that included tenor saxophonist Jack Montrose. This recording project includes performances of Joy Spring, Sweet Clifford, Sandu, Daahoud, Swingin', LaRue and Minor Mood. Cecilia also recorded Daahoud on her own 1998 album "Higher Standards " (Interplay). For more from the "Home" album, check out Two Sides Of A Penny. This album also contains a quintet version of Posie. 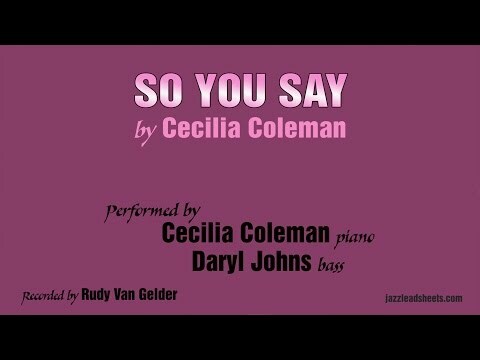 Duo performance of Cecilia Coleman's SO YOU SAY by Cecilia Coleman on piano and Daryl Johns on bass. Duo arrangement by Don Sickler. Audio recorded by engineer Rudy Van Gelder at the Van Gelder Recording Studio, June 30, 2012. Pianist Cecilia Coleman and bassist Daryl Johns recorded the arrangement by Don Sickler, at Rudy Van Gelder's studio. Don's idea with the arrangement was to make the bass more involved as a melody instrument. See the Bass Corner tab for more. Don Sickler first heard the 13-year old bassist Daryl Johns play during the 2009 Thelonious Monk International Jazz Bass Competition, where he received special mention. Don had the idea that Daryl should play with and play the music of composer/pianists from Don's Second Floor Music/Twenty-Eighth Street Music catalog. During the next few years, Don introduced Daryl to quite a few of those composers. All sessions were recorded by Rudy Van Gelder, at Rudy's Englewood Cliffs, NJ, recording studio. Most were filmed, with the result that you can hear Rudy's great audio while seeing the artists perform. This composition already had an active counterline role for the bassist (see the Concert Condensed Score from Cecilia's quintet recording above). In this new duo context, with no drums to fill in any holes, the bass was given even more. The bass takes over the melody [measures 7-8], then hands it back to the piano while going back to the countermelody role, until taking over the melody again for the last five measures of the A1 section. A2 starts the same as A1, except the piano never relinquishes the melody after ninth measure. From the bassist's point of view: It can be a real treat to be able to satisfy the responsibilities of accompaniment while also expressing yourself melodically. Too often, young bassists get turned off by the lack of melodizing apparent in their perceived view of the bassists' role. Happily, the bass part on So You Say will show that this disappointed view is unnecessary: the foundational harmonic structure of roots and fifths is at the forefront, yet melodic interventions are required as an integral part of the song's frame. For instance, take the first two measures. The bass plays a whole note root on bar one, but on bar two plays a fascinating melodic line in unison with the piano. Measure five is another excellent example of this combination. The bass fills out the integral supporting notes of root and fifth, but does so using a rising eighth note line for the first half of the bar and then holds out the root for the second half. These situations allow for learning convincing accompaniment while being an integral melodic voice. In addition, all of these melodious happenings can be digested like fresh nourishment for your lexicon. They are effective melodic gestures on their own, even if they weren't efficiently placed in the proper holes and spaces as they are here. Lastly, this part forces the player to cover a vast amount of registers and range, which will increase overall dexterity and help them learn where or when an upper register interjection can bring the music to the next level. The counterpoint in this song makes it ideal for a Rhythm Section Workshop. In the original quintet arrangement, the piano plays the melody with the horns as well as the counter melody with the bass; this means that a trio version is possible without any rearranging, and this is what our Rhythm Section Workshop version is. It does not contain any of the further piano/bass counterpoint from our duo arrangement (second album cover). We have two different Rhythm Section Workshop recordings. One is a similar tempo to the original version, while the other is an easier version that is considerably slower. Minus You tracks are available for piano, bass, and drums on both versions. There are two editions of the Piano part: one with voicings, one without. Your choice—some pianists prefer not to see written-out voicings. Composer Cecilia Coleman, a California native, relocated to New York City in 1998. Although she and jazzleadsheets.com's founder Don Sickler had met in California, it wasn't until Cecilia moved just a few blocks away from the studio that the two developed a close musical friendship. Cecilia, Bobby Porcelli, bassist Tim Givens and drummer Vince Cherico spent many hours in the rehearsal studio together with Don, working on Second Floor Music titles. Their hard work eventually resulted in "The K.D. Challenge" and many of the tracks on jazzleadsheets.com today. Both our regular Rhythm Section Workshop recording and our slower version have Minus You tracks for piano, bass, and drums. Each instrument has been provided with a separate part which works for both tracks. Note that the last three measures of the melody are played at the end of the last drum solo chorus to lead back to the out melody. mp3 minus Drums—sticks throughout. This is our first Rhythm Section Workshop recording in which there is a drum solo accompanied by walking bass. Our slower version has two piano solo choruses, but no bass or drum solo. The arrangement is the same. mp3 "slower"minus Drums—brushes throughout, though sticks could also be used.